I first met Maria Wulf at the East Poultney Historical Day a few years ago. This is a lovely annual outdoor festival held on East Poultney's village green and commemorates this lovely old Vermont town. Being a fabric artist myself I was drawn to her booth filled with unique and colorful primitive/modern quilts using recycled materials. I appreciated their true historical quality, as quilts in past days were mostly made of left over or recycled fabric of whatever kind was available and made to provide warmth. I thought her combination of materials in her quilts were bold and more interesting than those made with special quilt-store, color-coordinated materials. 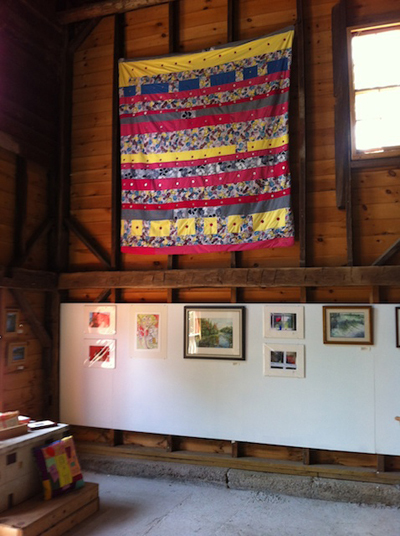 I love textiles and her quilts showcased her love of them as well. This was the beginning of our relationship. Maria and I purchased a sample piece of work from each other and exchanged cards, and emails, fully intending to get together, and I had promised to keep Maria posted regarding Vermont's regional quilt shows, as she lived in upstate New York. Our next in-person connection, however, did not happen for a couple of years, when she invited me to participate in her Pig Gallery Functional Art Show. Maria featured one of my pincushions on the invitation and she and her husband, Jon came to my house to photograph some. Jon and Maria were drawn to my dog, a very young pup that I crated during their visit. She shyly mentioned Jon’s love of dogs, though I did not know about Jon or his well-loved stories about his dogs and farm animals. My dog, was a young rescue pup at the time and a very out-of-control dog with boundless energy ready to rudely assault anyone new to the house. Jon had simply brought Maria and had come with his camera in hand to photograph my pincushions and my dog, Cassie remained in her crate! Her sale was one of the most successful events I had ever participated in. It was held in their refurbished Pig Barn on their Bedlam Farm. It was a scenic location, made more beautiful by the changing colors of fall, but Maria’s quiet and hospitable nature was what made this sale so successful! She was there to showcase the artists and their work and her own creations took a quiet place among those of her guest artists. That is Maria. She is modest about her own work, and truly out to support others. Her work however, was not to be missed. She had a lovely quilt in this show along with her free-motion, intricately designed quilted pillows (that she refers to as her "streaming pillows") and her handsome and colorful potholders. (Click here for Full Moon Fiber Art Website). 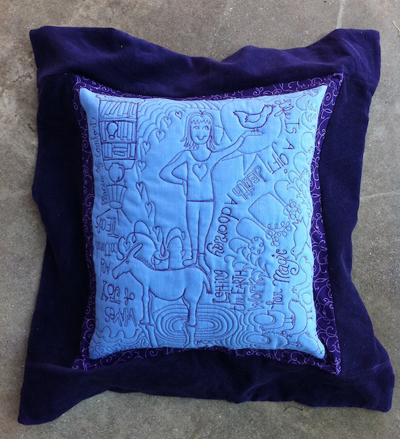 Click here for to read more about this pillow "Life is a gift, death is a doorway". I had tried free-motion quilted designs and learned first-hand how hard they are to get nice even stitches. It must be done with a relaxed and free flowing motion. Machine work is faster and so a person needs to be very fluid indeed and be ready to quickly and confidently guide their material to stitch their designs. I would immediately freeze and wish I had lines to follow and even then, I found it hard to relax and let the designs and stitching flow freely! How interesting that this quiet woman who ran the best sale I had ever participated in was master of this sort of art medium. Like the rest of her life, it seems she flows freely and expressively, making the hard look simple and easy! Jon writes about Maria in his blog and captures her in pictures demonstrating this same confident, quiet and gentle but strong style. Whether she is throwing hay bales or comforting Simon, their blind donkey that they rescued from abuse and in much need of healing, she exudes that quiet strength of purpose and integrity. So when you go to Maria’s site note the strength of the colors she uses in her quilts, the simple boldness of her designs and the free flowing use of her stitches and free hand designs in her work. 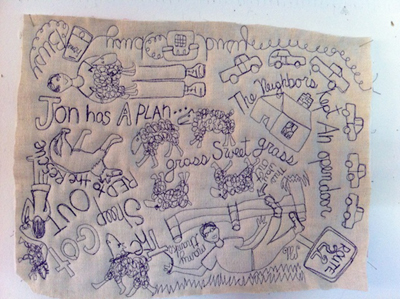 Read about her creations, for each has a story, and see her in pictures on her husband’s blog (Bedlam Farm) as well. Her humor, and her quiet, gentle personality exudes a kind and intelligent nature that flows through her work. Truly she is an artist in every project she undertakes! It is a delight to know Maria and I hope you will enjoy her blog as much as I do…and Jon’s blog adds to what Maria is too modest to say about herself! Her rural strength will inspire you! 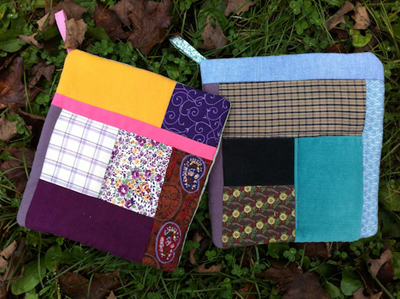 Don’t miss your chance to win these potholders for your kitchen. Simply add your comment on her website to register your chance! Hi Jane, I second everything you've written about Maria!